As August continues, a number of game jam events are scheduled to take place. These game jams are giving opportunities for smaller indie developers to showcase their skills and network with others in the gaming community, all while enjoying a fun atmosphere. According to the itch.io page, the theme for this game jam was selected by getting suggestions from participants and then the top category was voted to be the theme used for the games created, this year the theme is “Identity”. The top games in each category will then be awarded prizes. To participate in the jam, you do not have to be a certain nationality, sexuality or gender; everyone is encouraged to join the celebration and use whatever skill they can bring to help create. Submissions are made through itchi.io and participants can work in teams up to four or individually. 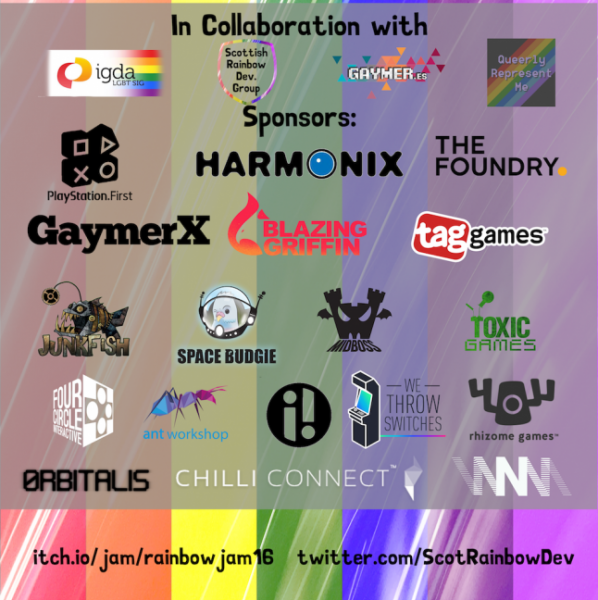 The jam was started due to the feedback and discussion from the Facebook group Scottish Rainbow Game Dev. and they are looking for more sponsors and participants for the jam and possibly for future jams. You can join or learn more about this open game jam at the website https://itch.io/jam/rainbowjam16. This game jam is just one example of how to encourage diversity and new talent in the gaming industry. New voices, ideas and styles can mean a breath of fresh air and more choices for not only publishers, but for consumers as well.